Roy Rogers Rules, Out of Date or Still In Style? I was a young girl when Roy Rogers was on television. I was 5 or 6 when my family started watching “The Roy Rogers Show.” At that time there was one television in the house and it was black and white. Children watched what their parents watched. Most of the time the shows were pretty mild; it wasn’t like it is today because there were television censors so kids could pretty much watch what their parents watched. In 1961 reruns of “Roy Rogers” were broadcast on Saturday morning. I loved Roy Rogers. He was so cute as an older man to have a crush on. My cousin Rose also loved Roy Rogers, and Rose and I, along with cousins and friends, would play out in the grove and pretend we were the cowboys and Indians. It was what we did in those days; we used our imagination to have fun. Every time I think of Roy Rogers or see Roy on television in old reruns, I think of my cousin and the fun we had. This week I celebrated another one of those birthdays. Imagine my surprise when I received a card with a picture of Roy Rogers on the envelope. I didn’t have to look at the return address to know who had sent the card. It brought a big smile to my face. 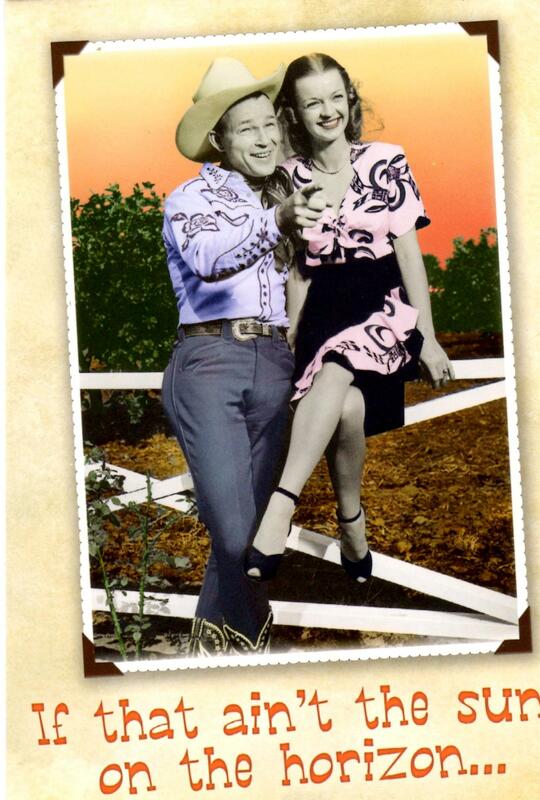 The card also had a picture of Rogers and his wife, Dale Evans, on the front, and it was signed by my cousin, “from my boyfriend, Roy and me.” It gave me a big chuckle for my day. On the back of the card were the Roy Rogers Rider Rules. I thought I would share them with you. 5. Be brave, but never take chances. 9. Love God, and go to Sunday School regularly. These rules were part of the Roy Rogers Riders Club, started in the 1940s. Any child could join by sending in his or her name and address. A Rogersgram, which looked like an official telegram, was sent and it arrived by Trigger Express. Trigger, for those who don’t remember the show, was Roy’s horse. I still have my card somewhere in my memory boxes. We took these rules seriously. Our parents liked these rules because they mimicked what they told their children. Looking at these rules some 74 years later, I believe Roy’s rules should be rules everyone abides by in 2014. Taking care of you, treating others with respect, being kind to God’s creatures and paying attention to how we live in our world by not wasting are great standards to live by. The ones to me that the most important are: Love God, and always respect our flag and our country. Respect doesn’t mean blindly following. Respect doesn’t mean agreement when your heart tells you to disagree on an issue. The definition of respect in the dictionary is a deep admiration for someone or something elicited by their abilities, qualities and achievements. I have been thinking long and hard about respect this the past week as I followed a conversation by a friend on Facebook on harassment of women in public places, such as convenience stores and fast food places, by roaming lotharios. The argument got heated when a couple of men joined in the conversation and said both sexes had problems with that. As I read Roy Rogers Rider Rules I thought about this conversation. I have never liked “The Honeymooners” that used to be on television in the ’50s. I did not like the comedy in the way Ralph treated Alice. Even as a child I did not like it. I did not see the humor in the disrespectful way he treated her although at my young age I didn’t realize what my dislike was for. Fast forward to today’s comedies on television and you see someone getting sexually harassed or disrespected every day. Why is it that it is accepted behavior on television and not accepted behavior in real life? Is it any wonder those that are leering when my friend visits public places, get the idea that leering at women or even men is acceptable? We don’t seem to have that deep respect anymore for each other and for our country. Maybe it all boils down to one thing and that is respect for one self. Our behavior, what we do and what we say, reflects our own self-respect. If we don’t respect ourselves how can we expect respect from other people? Perhaps those that leer, berate public officials or the person in the car next to us shaking their fist, have less respect for themselves and their behavior, than the person they are directing their behavior at. If we don’t know how to respect ourselves, how can we show respect for others and how can we show respect for our country? Deep thoughts for an old birthday gal, but that is what age is all about, wandering pondering. Previous Snicklefritz! A New Book! Another Grandma In Trouble. Next Living An Ordinary Life? Never.